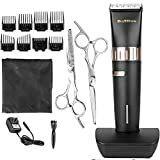 As a professional barber, you only want the best equipment for your clients. After all, a stylist is only as good as their tools, right? Which is why you must only opt for the best hair clippers you can find. But what makes a quality clipper? Before buying one, ask yourself the following questions: Is the blade sharp? Is the motor durable? Is the unit generally versatile? All these factors will largely determine your clipper’s performance and durability. Have a look at our top three picks for the best barber clippers below so you can find your new favorite tool. One of the best professional hair clippers in the market right now. If exceptional performance is what you’re after then consider this hair clipper from Wahl designed for sharp and precise cuts. The Detailer is the preferred unit among experts in the industry for the above-mentioned reasons and more. Strictly designed for professional use, this clipper features an extra wide T-blade which you can easily adjust for those close cuts. Not only is the gadget loved for its functionality but also its stylish design and compact nature. The trimmer also fits in the palm of your hand for optimum control. The only major disappointing aspect of this product is the quality of the cord; it tends to break after a few months. Also, the blade surface tends to rust quickly. A noise-free hair trimmer is always a good idea and that’s one of the major selling points for this BuySShow clipper thanks to the ultra-quiet design. Are babies and kids part of your clientele? Then this is the brand to pick because the quiet performance will help keep them at ease. Because this barber clipper has round edges, it also makes it safer on kids. You’ll appreciate that unlike the Wahl trimmer, the titanium blade is less likely to rust. So by picking this brand you’ll have a durable product on your hands. Moving on to the downsides, the charging time is rather long taking up to four hours to get a full charge. And it only comes with one clip guard so you’ll have to make an additional purchase if you require more. Andis is well known for its high-performance products and this professional beard trimmer meets the same standards. The T-blade and fine cutting teeth on the unit make it the ideal hair clipper for close cuts such as fades. The trimmer is designed to perfectly fit into your hand thanks to the contoured housing. Because the powerful motor runs at high speed, you’ll be done with your trimming job in no time. You can tell by the hardened carbon steel blades that you’ll be using this product for a long time. The drawback you have to deal with is that the trimmer heats up if too much hair is trapped inside. Finally, the one we recommend is Wahl Detailer Powerful Rotary Motor Trimmer. You’ll never regret if you buy this professional hair clipper. From the three products reviewed above, did at least one grab your attention? It’s time to look at your best or use it to make others look great with any of the above beard clippers.